If someone in the bar even brings up the topic of ‘mid-engined supercar', a heated commotion will erupt with everyone eager to chime in. Everyone loves talking about those elusive supercars that many could only ever dream of attaining. Amongst all the ludicrous supercars though, two particularly venerated marque arguably stands on top: Lamborghini and Ferrari. With Ferrari recently introducing the new 488 GTB, and the Aventador remaining as the flagship for Lamborghini, these two may just be intriguing subjects for a bit of top trump or performance comparison. Of course, the biggest disparity between the two is the model year introduced. While the Aventador is beginning to show its age, being initially introduced in 2011. However, the original Aventador isn’t actually made anymore, as the facelifted model, the Aventador S, completely replaced the original model in 2016. The Ferrari 488 GTB was originally incepted in 2015, so it’s more modern overall. The contrast in model year is apparent when you peek into the engine bay. While the modern Ferrari 488 GTB features a fully-aluminium 3.9-litre twin-turbocharged, twin intercooled V8, the Aventador boasts an engine that now seems archaic in comparison, a 6.5-litre naturally-aspirated V12. However, the power output is actually very comparable as the 488 GTB produces 661 horsepower and 561 lb-ft of torque with the aid of forced induction while the Aventador outputs 690 horsepower and 509 lb-ft of torque entirely through brute force. 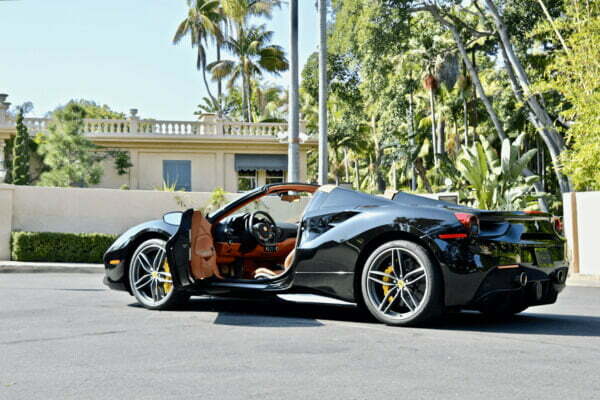 Ferrari's twin-turbo V8 is then married to a proper 7-speed dual-clutch automated manual transmission offers one of the quickest gear shifts on the market. To reduce weight though, Lamborghini decided to opt for a 7-speed single-clutch semi-automatic transmission instead. It is one of the best single-clutch units you can find, but it's still single-clutch. That said, the 488 GTB is rear-wheel driven compared to the Aventador which delivers power to all four wheels. Both cars will propel themselves from 0-62 mph in around 3 seconds though. It can definitely be argued that both cars are built to suit different crowds. The Ferrari 488 GTB, relatively speaking, is the pragmatic Italian mid-engined supercar to have. Its high-tech turbocharged V8 engine touts one of the best horsepower/litre figure we have seen so far. That, combined with the comparatively light 1,470 kg kerb weight and massive 305/30 rear ultra-high performance tyres mean that the 488 GTB will absolutely fly in a straight line, all the way to over 205 mph. Of course, it wouldn't falter on even the twistiest canyons. With massive carbon-ceramic brake rotors and complementary beefy brake callipers, it will shed all of its impressive speed in seconds. Being a track-focused road car, it will still dance graciously from corner to corner with a natural rhythm on normal roads, but thanks to the variable driving modes with adaptive dampers 458 Speciale, it can sharpen up drastically for smooth tracks. Its corner aptitude is apparent from its 7:21.63 Nürburgring Nordschleife lap time. The Aventador is definitely the showstopper here though, especially when it first came out. In traditional Lamborghini flagship tradition, it was made with the specifications sheet in mind. Big 6.5-litre naturally-aspirated engine, 690 horsepower, 509 lb-ft of torque, 3-second 0-62 mph time, 217 mph top speed and an almost half-million price tag. It’s a heavy car too, even though the engine is rather lightweight at 235 kg, tipping the scales at nearly 1.6 tonnes. With four-wheel drive and launch control, the Aventador will absolutely pin you to the seat if you stomp on the throttle. Certainly, in terms of dynamics, the 488 GTB will best the Aventador. But you will still be startled when you throw the bull around corners, it will turn itself nicely with lots of traction but ever so biased towards oversteer. It also has massive brakes that’ll halt itself on a dime. While it clocks a slower Nürburgring time at 7:25.00, it’s unlikely that you’ll ever be complaining about that. You won’t ever find yourself worrying over handling because of the V12 symphony behind you. The Aventador has one of the most distinctive exhaust note amongst all supercars, and it revs all the way to 8,500 rpm rewarding you with a spectacular orchestral crescendo. With ever-stringent emissions law, this type of large-displacement, many cylinder naturally-aspirated engines are being threatened to extinction, and the Aventador takes the cake for being something special. Both the Ferrari 488 GTB and Lamborghini Aventador are unique in their own ways. That said, in terms of outright performance, the 488 GTB will outclass the Aventador. But then again, the Aventador is now defunct, and the replacement Aventador S is a different beast, and there’s always the ridiculous Aventador SV. With naturally-aspirated engines making less and less sense though, it’ll be intriguing to see where Lamborghini brings their flagship lineup of poster cars. Thanks for our friends at 777 Exotics Car Rental in Los Angeles who penned this comparison and provided the original images of the Ferrari and Lamborghini. Awesome fleet guys! I always wondered how a V8 could be better than a V12, but well, now I understood. Great article once again! Can anyone rent a supercar, without any restrictions? Well, it depends...for you to get the best answer, I would advise you to contact 777 Exotics and ask them personally...They will be able to help you better. wow i love t hat SO much about this Transmission Repair West Palm Beach topic. can i cut and paste it into my blog?? but give u credit, of course?? ?